Say it ain’t so. The City of Oakland issues May Day threats of suspension to union workers. City of Oakland SEIU Local 102l union members have filed Unfair Labor Practice Charges against the City of Oakland citing a long list of labor abuses including threatened disciplinary action against union members for their participation at a May Day rally in front of Oakland City Hall. While ships were docked up and down the California Coast in a day-long ILWU protest against the War in Iraq, City of Oakland union members as part of a labor coalition that includes the City’s Firefighters, SEIU Local 1021, SEIU Local 1877, IBEW, and IFTE rallied to commemorate May Day and to protest labor abuses by the City of Oakland. 500 members of the four locals and their supporters rallied at City Hall in a first ever May Day Unity rally as they face simultaneous contract expiration dates this June. City of Oakland, SEIU 1021 union members formed a lunchtime convoy of City trucks and vehicles at the May Day rally in front of City Hall, to both honor May Day as part of a day long West Coast Port shut down and to demonstrate concern about contentious City of Oakland labor contract talks. During the rally, City of Oakland Human Resources personnel were sent out to the rally by City of Oakland officials to take down the names and numbers of the trucks and their drivers in a visible showing of their intent to threaten and intimidate the drivers; supervisors were later ordered to name names. As of Friday, threats of suspension were pending against the drivers for their May Day participation. 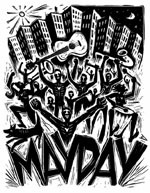 The Unfair Labor Practice charges were filed against the City of Oakland on April 30, 2008 and were amended to include the additional May Day threats. The diverse and united crowd rallied around the common theme of worker justice and equity that is as true now as it was when workers first organized for justice. They drew May Day inspiration from retired Local 21 member Mahlon Harmon who addressed the significance and importance of May Day. In addition to the Unfair Labor Practice charges, the City of Oakland was cited by rally speakers for its abuse of temporary workers. There are over 500 “temporary” workers at the City of Oakland who work “at will” with no benefits and who work under the constant threat of being fired. Some have been “temporary” for over 10 years. They are disproportionately women and people of color. Say it ain’t so City of Oakland. In contrast, Union leaders decried the hundreds of high level City of Oakland Officials who “make over $100,000 a year.” In addition to its abuse of temporary workers, the City of Oakland is proposing a two-tiered health care plan. Rally speakers included Brad Walters, President of Oakland Chapter SEIU 1021, Vice President Dwight McElroy, Sharon Cornu, Central Labor Council of Alameda County, representatives from IFTE, Local 21, Reverend T. C. Wilson and others. The Unfair Labor Practice charges allege a wholesale list of violations aimed at limiting Union power. Charges include unilateral changes that interfere with Union Stewards representation of Union members, efforts by management to coerce and threaten Union Stewards to induce them relinquish representation of Union members and unilateral changes that interfere and impede with the Union’s duty to meet and confer with the City of Oakland on behalf of its members. According to member leaders some people at the City of Oakland are “drunk with power, making intoxicated decisions,” that have hurt the long term working relationship that has existed between City of Oakland and its Unions. Transparency in the promotion process has been eliminated. There are widespread attempts at adjusting the meaning of a labor contract that “everybody helped mold” and understood. Now there are daily attempts at circumventing contract language. “They are trying to re-write our contract without ink,” said one leader. Nonetheless, Union leaders have been consistent and united around one thing. That is that they are directing their fight against the City of Oakland. The May Day threats, the abuse of temps, unilateral changes, attempts at intimidation of their activists and all the rest have forced Union leaders to take the unprecedented step of filing Unfair Labor Practice charges against the City. All the while, meetings with City officials have yielded nothing. With only two months left until the contract expires, time is running out. Right now union members are holding out the hope that they will not be forced to do what they may have to do. They also appear just as resolved to do it. There is an old Union axiom: There is nothing like a bad boss to organize workers. Unfortunately, right now at the City of Oakland, that appears to be so.